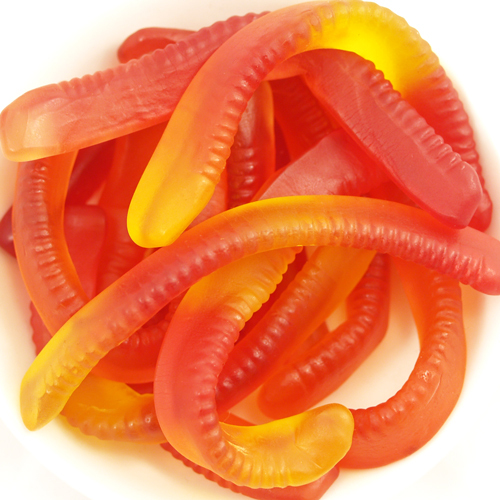 Traditional, chewy-style gummy worms, now made without corn syrup. Bright, clean, yummy flavors. Made with organic sweeteners. Contains gelatin. Ingredients: Organic tapioca syrup, organic cane sugar, gelatin, organic grape juice concentrate, citric acid, lactic acid (non-dairy), ascorbic acid, colors added (black carrot juice concentrate, organic turmeric, organic annatto), natural flavors, organic sunflower oil, carnauba wax. 91% organic. Each 2.75oz bag contains about 8 worms. These were delicious! Go with the gummy and not the sour, sour were very strange and not the consistency of a gummy worm. The regular ones are delicious and gummy! The worms don't come any better, but the caramels, all of them are the BEST we ever had. Cant leave out the pecan brittle, now ask my better half his comment is WOW!!! This is my 4th order just love it all. Every time someone drops by they all know the candy dish here has the best candy EVER! The surf sweet gummie worms are my daughters favorite candy. We have ordered them multiple time and bought them at higher end grocery stores.. Never had a problem with them being too hard. Closest thing to candy other kids eat without all the yucky chemicals. Good job Surf Sweets. The outsides of the worms were a bit oily. The texture was VERY chewy and slightly hard to bite through. When I ate a handful at once, I got a pretty bad tummy ache. Try their gummy bears or sour gummy worms instead, those were much better. These I will not be buying again. These are a wonderful treat. They have a great taste and texture. My children love them! I LOVE gummy worms. Unfortunately, with all the crap that's in candy now, I haven't been eating any. Just ordered these from this site the other day and they taste great! Just like the ones I used to eat but without the garbage.